As part of the DEVELOPPP.de project, in cooperation with Prevent Group and with the support of the German government organization GIZ, the Hastor Foundation initiated a project titled “IDEAL – Improving and Developing the Educational and Learning System for plastic workers in BH”. The aim and main focus of this project is the improvement of the quality of vocational education for plastic workers so as to create a group of experts specialized in working on the latest machines for the purposes of the Prevent Components company, as well as other companies in the area of the Bosnian-Podrinje Canton. The activities that are to be carried out over the course of this project are: development of the vocational standard for the vocation of Plastic worker, creating the new syllabus for the vocation of Plastic worker based on the developed vocational standard, training of teachers and mentors in companies, introduction and implementation of the dual system of education for the abovementioned vocation in secondary vocational schools, and starting adult trainings for the vocation in Goražde. The implementation of the project began in September 2018, and the project is planned to last for two and a half years. In the period from the 15th of September 2017 to 30th of September of the current year, the Hastor Foundation, together with the Prilika Plus Program and with support of the Embassy of Switzerland, successfully carried out the project called “Strengthening of Educational Practices in Bosnia and Herzegovina – Introducing the Dual System”. The aforementioned project consisted of two primary components, one focusing on formal education and the other one on informal education. Activities related to formal education focused primarily on improving practical learning in secondary schools, while the aspect of informal education had to do with training adults to perform certain jobs. Other aims of this project were, among others, the improvement of the overall quality of TAKT Academy, including its position on the market and ensuring that the best possible trainings are available for its participants, as well as forging a stronger bond between local communities, schools and companies. 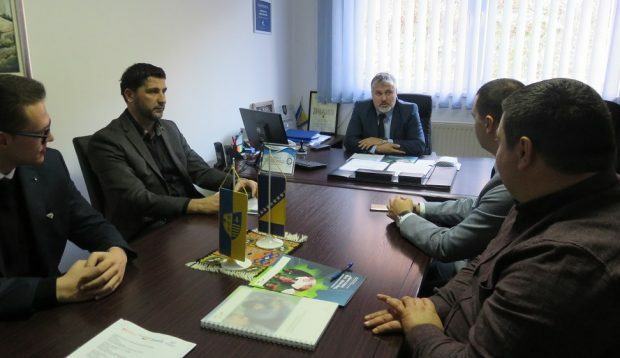 The essential aim of this project was to secure relevant and quality training for youth and adults alike which would enable them to improve their existing skills and competencies, but also ensure the adjustment of human resources in accordance with the new technologies of leading companies in BiH and beyond. In the period from the 1st of April, 2018 to the 31st of October, 2018, the “Training for Job – Training to Stay” project was implemented in cooperation with the Prevent Group. The project was supported by Workforce and Higher Access to Markets Activity (WHAM) project, which is financed by USAID and implemented by IESC. The project's aim was providing training and development of skills that are necessary for securing employment in the Prevent Step Bugojno Company. During the realization of the project, 5 trainers were educated, who then provided training for the participants of this project and are now qualified to provide quality training for future employees in the time to come. The training program included 90 people from the area of Bugojno Municipality and the nearby areas, and the 60 who completed the program most successfully were given an employment opportunity in Prevent Group companies. Marking of Earth Day was one more project in the wide range of the Hastor Foundation’s projects. In April 2017, with the aim of marking Earth Day, the Hastor Foundation and its scholarship holders organized several events, the first of which was the April monthly meeting of college student scholarship holders of the Hastor Foundation, the purpose of which was to raise awareness about the global threats of environmental problems. This lecture was only an introduction for further events organized soon afterwards. 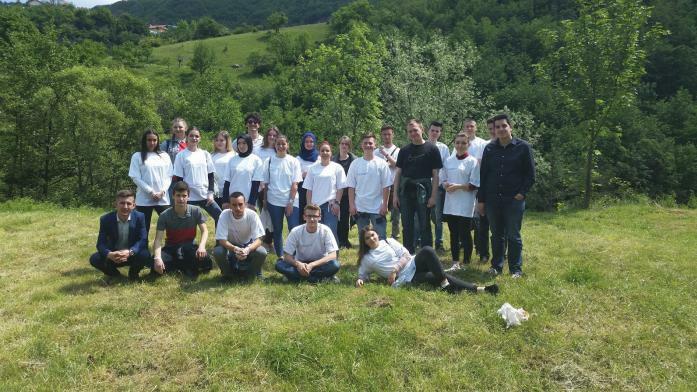 In the spirit of marking Earth day, the Hastor Foundation scholarship holders organized cleaning of the river beds of the Miljacka and the Drina River. On Earth Day over 60 volunteers of the Hastor Foundation worked together to clean the Ambassadors Alley near the Miljacka River in Sarajevo and one area of the Drina River bed near the “Plavi Cvijet” park in Goražde. This project is a unique one, and its significance was recognized by BH Postal Service in 2016, as well as the State Lottery of BH, and the Hastor Foundation is planning similar projects for the years to come. Since 2006, the Hastor Foundation and organization Kinderhulp Bosnie from the Netherlands have carried out a project called “Summer Holidays in the Netherlands”. Each year, children from socially vulnerable families of Bosnia and Herzegovina travel to the Netherlands for a three-week holiday and education. The Hastor Foundation has been helping in the participants’ selection of children and preparation of necessary papers. Scholarship holders-volunteers of the Foundation accompany the children on their trip to the Netherlands as attendants. Due to the floods which hit Bosnia and Herzegovina in May 2014, the Hastor Foundation, together with ASA Prevent Group, has established Srcem za BiH ('With Heart for BH) Fund and in that way joined the process of aid distribution to flood-affected areas as an active participant. Activities of this fund were reflected in three types of programs focusing on intervention, housing and sustainability. The work effort of Srcem za BiH Fund was recognized by many other companies, including the Robert Bosch Stiftung, Samen Sterk, Gorenje and Sparkasse Bank. Through joint actions, Srcem za BiH Fund has alleviated effects of the floods and ensured sustainable recovery in the areas affected by this disaster. TAKT Academy is a unique project, which has for the past several years been realized by the Hastor Foundation, in cooperation with the Swiss Agency for Development and Cooperation (SDC) and the Embassy of Switzerland in BH. TAKT Academy provides its trainees the knowledge and skills needed to work in the fashion, textile, furniture and automotive industries. The program offers a systematic approach to adjusting the educational system to the labor market needs and includes production programs and business process management. The target group includes the graduates of secondary vocational/technical/mixed schools and graduates of technical and social sciences faculties. Due to the lack of adequate resources in the labor market, the ASA Prevent Group initiated an internal training for young graduates and postgraduates in 2015, which was at the time a pioneer step for a company. Over time, the project gained other partners, so nowadays we have a recognizable program – the TAKT Academy, which provides young people with an opportunity for their first employment. The trainees of the TAKT Academy first receive theoretical, and then practical training. Six young artists, the Hastor Foundation's scholarship holders, had the opportunity to participate in the Brave Kids festival in 2014. The mission of this festival's organizer is to provide support to young people across the world through artistic experiences, which will inspire them to look towards a better future for them and their communities. In addition, the aim of the Brave Kids Festival is to encourage intercultural understanding among the future generations by bringing together young people from different countries through their working in joint projects. UNESCO recognized and supported this festival. Prilika Plus, supported by the Government of Switzerland, is a project devoted to improving professional education in Bosnia and Herzegovina. The purpose of the Prilika Plus (Skills for Jobs) project is to ensure a quality professional education and further improvement for young people in 25 locations. The role of the project is to improve the quality and capacities for professional training and the competence of teachers and mentors through the development of functional social partnerships between school, companies, authorities and institutions. In 2015, the Hastor Foundation initiated the TAKT Academy program in cooperation with the Prilika Plus Program and the Embassy of Switzerland in BH, and in that way the Foundation officially became a partner of the Prilika Plus program. In June 2014, the Hastor Foundation had organized the Flood Relief Coordination Forum in cooperation with UNDP. The forum was attended by over 100 participants – representatives of the private sector and the international community. 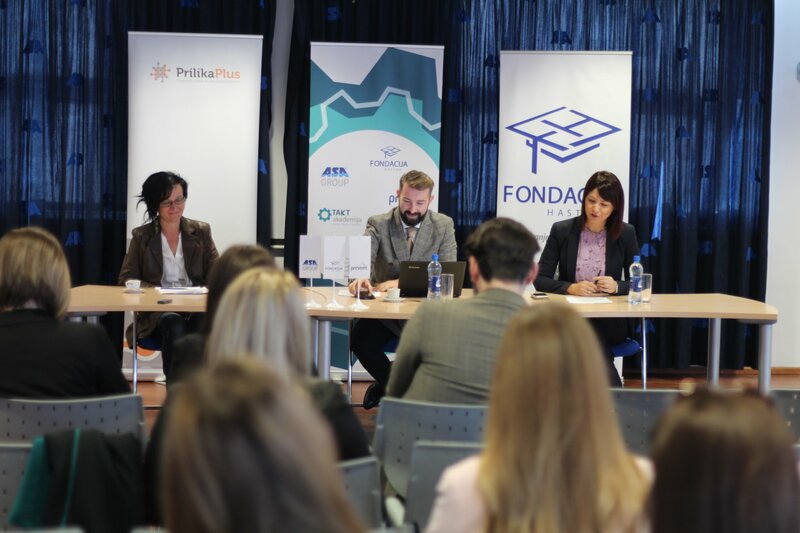 In April 2014, in cooperation with the project Prilika Plus and Posao.ba, we organized a panel discussion on how to develop human resources for the needs of prosperous industries in BiH. “Moja Liga” is a project organized in 2013 by the Hastor Foundation and the Ministry of Education, Science and Youth of the Sarajevo Canton, with the technical support of the Association for sport development BH Sport Centar, and with the aim to prevent peer violence, popularize sports and promote teamwork and friendship. More than 200 pupils from 15 secondary schools in the Sarajevo Canton area participated in this project. In 2013, the Hastor Foundation volunteers participated in a spring action titled “Metlom protiv nasilja” (Standing Up to Violence by Taking Up a Broom), which included actions of cleaning both the spirit and the environment and gathered a great number of young people. This cleaning action was held in the Wilson’s Promenade, and its aim was the prevention of juvenile violence.